If your child loves the Cars movies then you should check out this Lightning McQueen hoodie. 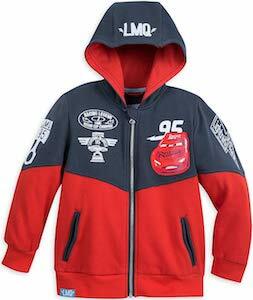 The kids hoodie is fleece so nice and warm and is red and blue with all kind of Cars details including a picture of Lightning McQueen. And it is a zip up hoodie for easy wearing and it could work as a jacket too. And you can get this Cars hoodie in kids sizes 3 – 8. I am sure you child is going to love you even more when your surprise them with this hoodie because it is just perfect for all the little fans of Cars and Lightning McQueen. If you like the Cars movies and snacks then you just need this Lightning McQueen popcorn maker. 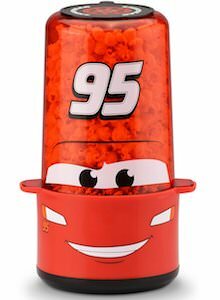 The popcorn maker is red and looks a lot like Lightning McQueen with the base that is red and the top is see-through and together show the face of the Cars star and his number 95. The Popcorn is made right in front of you in the top chamber and that is great fun for kids and adults to watch and in no time, at all, you will have fresh and warm popcorn that is made for you. The Cars popcorn container is made from BPA free Tritan plastic and comes with a measuring spoon for kernels and oil. 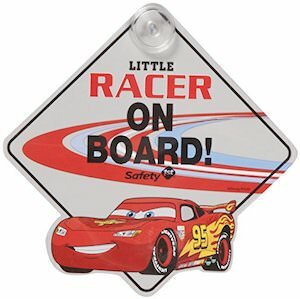 If you are looking for a baby on board sign for your car so that you can safely transport you little racer then you want this Lightning McQueen baby on board sign. The sign is white and on the bottom, you can see Lightning McQueen sticking out of the diamond and above him, you will find the text “Little Racer On Board”. And the sign has a suction cup so that you can keep it secure to your car window. Besides for telling drivers around you that you have a baby in the car this sign is also great as a gift for someone that likes to drive fast or for new drivers. 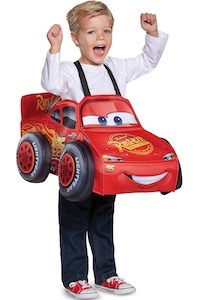 If your child is crazy about Lightning McQueen then you are going to love this 3D Lightning McQueen costume. This toddler costume just goes over the normal clothes and is like a big 3D foam Lightning McQueen and it just hangs from their shoulders making it super easy and it looks amazing. Your toddler probably is going to race around you home because now they are the car that won the Piston Cup. Cars 3 or a different Cars movie this costume is just perfect if you want to look like the movie star this Halloween or any other dress up occasion. Now there is a kids watch for all the kids that need to learn to read time and that like the Cars movies. The watch has a red watch with Lightning McQueen on the watch face and it has a yellow strap with many Cars details. And this wrist watch is a time teacher watch and that means it is perfect for teaching how to read a clock. Even the arms on the watch say what they are like “hour” and “Minute”. 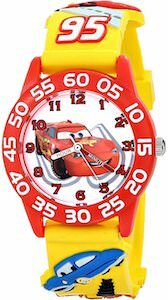 So maybe it is time to surprise your child with a really special Cars watch that has Lightning McQuee on it to teach them it is time for fun. 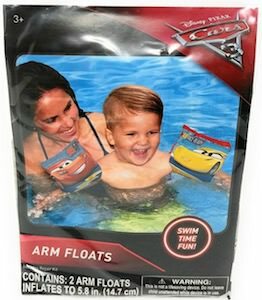 We all need to learn how to swim and thanks to these Cars 3 arm floaties kids can do that with their favorite movie characters on their arms. These arm floats are made for kids ages 3+ and have both Lightning McQueen and Cruz Ramirez on them and that will be so cool to have around your arms. The cars arm floats are easy to inflate and will keep your child above water. And in case one ends up getting a hole they even included a repair kit so that you child can keep enjoying them for a long time. 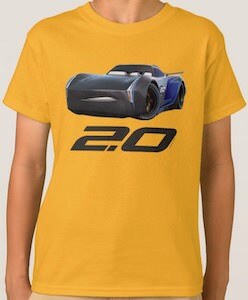 Now there is a Cars 3 t-shirt with Jackson Storm on it and a big 2.0 below him. You can get this Cars t-shirt in styles for men, women, and kids and it comes in many sizes and colors too so that everyone can enjoy the perfect t-shirt. Lightning McQueen would prefer it if you wear a t-shirt with him on it but you can wear this as long as you cheer for Lightning in the Piston Cup. Show the world the cool race car Piston rookie Jackson Storm is by simply wearing this cool car t-shirt. We all know that Lightning McQueen is getting a bit older and is not racing so great anymore but luckily he has Cruz Ramirez to train him back to shape. And you can own a figurine of Cruz Ramirez. This is a Pop! figurine made by Funko and it numbered 284 on the box. The figurine shows the yellow car complete with the number 51 on the side and some Dinoco advertisement. And unlike most Pop! figurines this one is rated ages 3+ so even kids can collect them and maybe even play with them. Support Lightning in his quest back to the top and that will start with adding Cruz Ramirez to your collection. 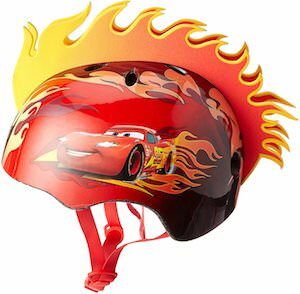 If your child wants to ride a scooter, bike, or do rollerblading then a helmet would be a smart thing to have and now there is this amazing looking Lightning McQuee flame helmet. This is not just any helmet this is one that has a big 3D foam flame hawk on top that makes it look like the kids are going so fast. The Cars helmet shows Lightning McQueen on one side with flames behind him and his racing number 95 on the other side. The helmet is made by Bell and that means quality your child needs. The Cars 3 Lightning McQueen helmet will fit a head size 48-52 CM. Now there is a Lightning McQueen car sun shade that makes your car a lot more like car number 95. 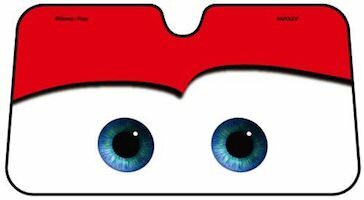 The car sun shade shows two big eyes and above it, it is red and that would transform your car’s windshield just like the one Lightning McQueen has. So now just paint a big 95 on the side of your car and people will believe it is a real life Lightning McQueen. Kids will love it too even though they don’t have a real car yet I am sure that they will like to see it on your car.